WestWind Unmanned and Sundance Media Group have partnered together to showcase sUAS (small Unmanned Aerial Systems) in Public Safety. 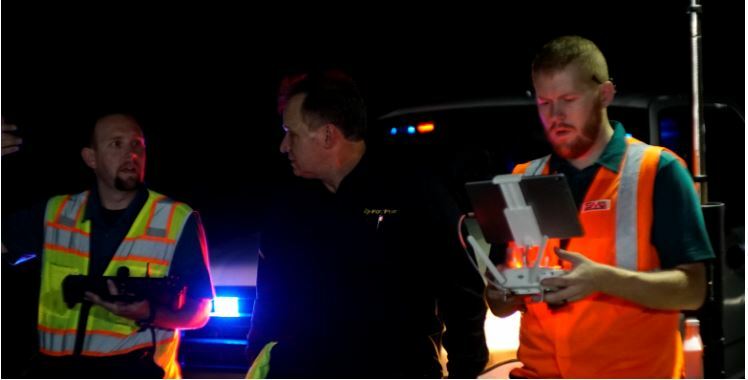 This unique roadshow is designed to educate agencies (law enforcement, fire, EMS, and other first responders) on the value of a turnkey drone program and how implementing drones into the workflow can decrease costs and personnel risks and increase efficiencies. 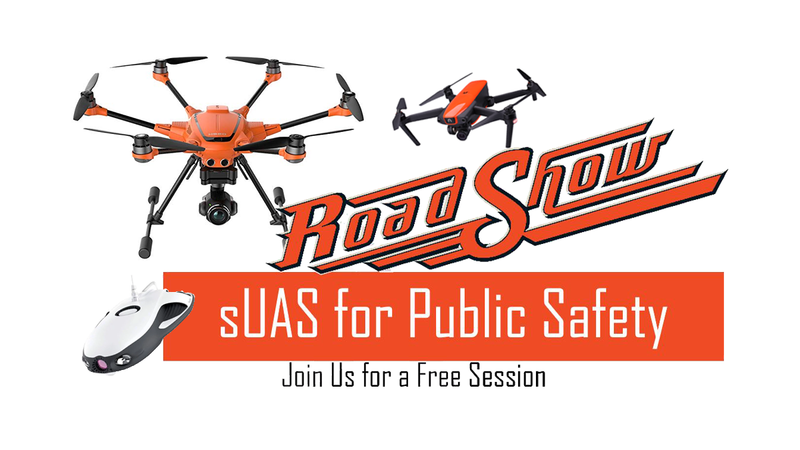 This free introduction to “sUAS as a Tool” will showcase the Yuneec H520 hexacopter and the DataPilot mapping program, the new Autel EVO as well as other accessories and technologies that create a turnkey sUAS solution for a variety of public safety applications. Our presenter will also showcase Brother AirScouter System, FoxFury Lighting Solutions, Venom Power, and Hoodman USA accessories. Join us for a two hour presentation and a flight demonstration. Seating is limited, so please register early. If you have any questions about the roadshow or its location, please email rsvp@sundancemediagroup.com. Be sure to bring all your drone / UAV / sUAS questions with you! ISC West is THE largest converged security industry trade show in the U.S. At ISC West, you will have the chance to network with over 30,000 security professionals through New Products & Technologies encompassing everything from access control to drones & robotics from over 1,000 Exhibitors & Brands. Join us at ISC West, largest converged security industry trade show in the U.S. Experience 3 days packed full with networking opportunities, education and new technologies revolutionizing the security industry. Drive your business into a brighter and safer future by exploring new products and meeting new security industry professionals. Enhance your professional skills by attending world-class educational sessions. If you fall into any of these categories, ISC West is the right fit for you! End-Users from various vertical markets including Healthcare, Education, Finance, Retail, Transportation/Public Safety, Hospitality & Entertainment, Oil/Gas/Utilities and more. Unmanned Security Expo @ ISC West returns this year focusing on Unmanned Aerial Vehicles (UAVs), Unmanned Ground Robotics & Vehicles (UGVs), counter-drone solutions and the various software and applications that support them. The market growth for unmanned technologies being used for security & safety benefits is progressing at a rapid pace, with the number of both commercial and consumer drones registering with the FAA causing an urgent concern for air space security. Unmanned Security Expo addresses the opportunities to improve security & safety functionality with the use of UAVs & UGVs, the threats that counter-drone technologies can address to ensure public & defense safety, and policy & regulation progress and key trends. Located right on the ISC West exhibit floor, Unmanned Security Expo ensures that participants interact with and reap all the benefits of the complete ISC West audience. Unmanned Security Expo will include exhibits and a dedicated education theater, as well as demos of the best UAV, UGV and autonomous systems on the market. Our presenters will also showcase Brother AirScouter System, FoxFury Lighting Solutions, Venom Power, and Hoodman USA accessories. 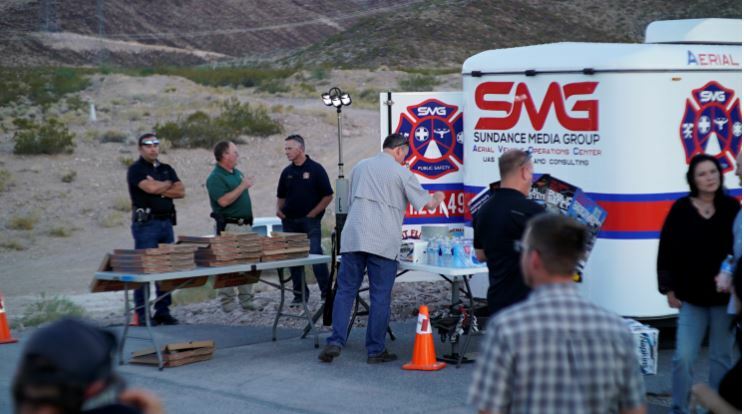 Botach, Inc. (OTC Markets: BOTACH) (“Botach” or the “Company”), Botach (a drone reseller), drone service provider and distributor of tactical products to the U.S. Public Safety channel, and the U.S. Government), announced a reseller/training partnership with Las Vegas-based Sundance Media Group (SMG), a company that specializes in assisting police, fire and private corporations with standing up training programs across the country and filing Certificates of authorization and/or waivers with the U.S. Federal Aviation Administration (FAA). SMG also creates or assists in the implementation of Policy, Procedures, and Operations manuals for ISO-compliant municipalities and organizations. 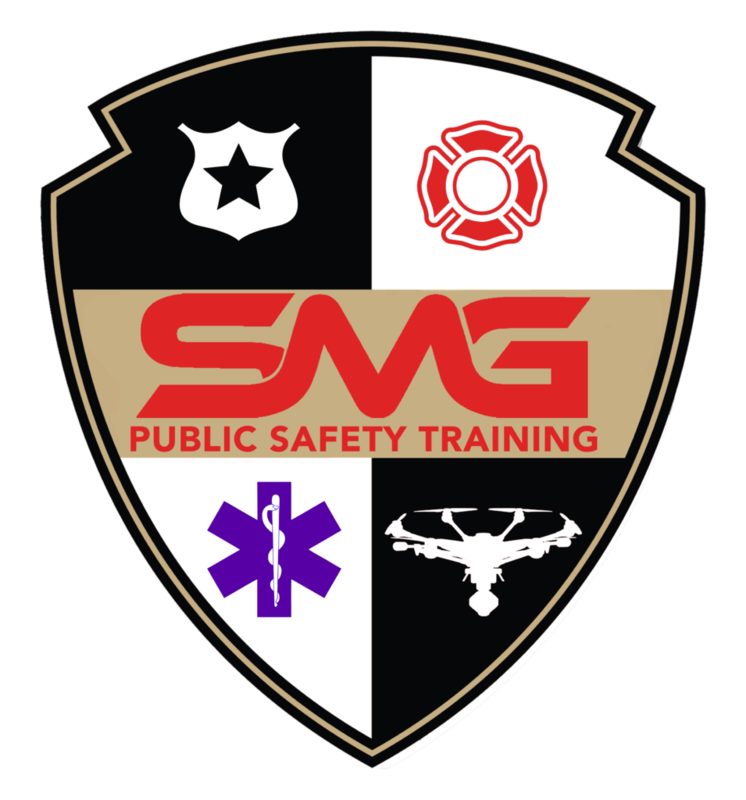 SMG has a 17-year history working in aviation, and has developed training missions for MIRT (Major Incident Response Teams), CSI, traffic homicide, night-time forensic missions, and crowd overwatch with and without tethering components. Botach Inc. is a family owned business and is one of the leading retailers of tactical and military supplies throughout our great nation. From duty boots to assault rifles, we sell products in every category in the tactical/military industry. Founded in the Los Angeles area, we have recently moved to a new home in Las Vegas. Las Vegas brings into a more shooter friendly environment to which we look forward to exploring and growing within. Our expertise has kept us in business for over 20 years. We take pride in caring for our customers. For additional information about Botach, please visit https://www.botach.com/. Founded in 1996, Sundance Media Group/SMG began as a training organization focused on cameras, codecs, and post-production technology. 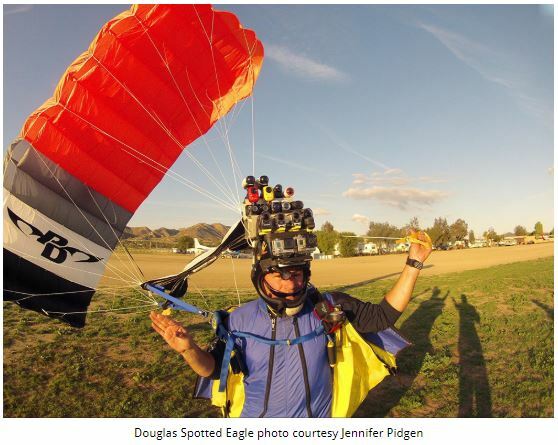 In 2004, the company began training in aviation technology, adding sUAS in 2011. In 2012, SMG produced the world’s first UAS training conference at the National Association of Broadcasters Post Production World Conference, and is an ISO-compliant organization. “1 October, Harvest Festival, Route 91” are all synonymous to Nevadans and first responders, marking the America’s worst-yet mass shooting event when a lone gunman in a high-rise hotel opened fire on concert goers (the official investigatory title for this event is “1 October”). 58 victims died of gunshot wounds. 422 individuals were injured by gunfire. 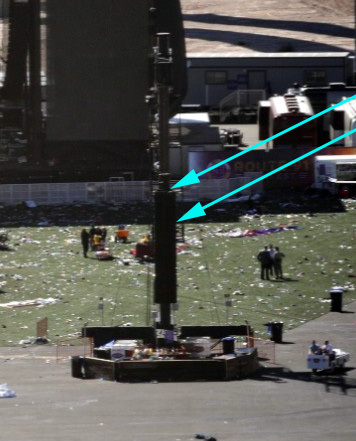 Approximately 800 concert attendees were injured from gunfire, trampling, or other injury escaping the chaos. 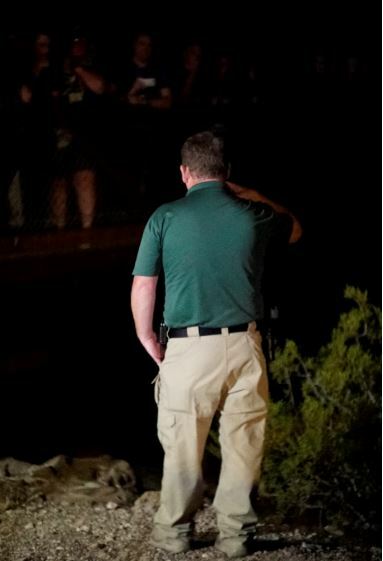 Over the course of several hours following the shooting; law enforcement, fire, EMS services, and civilians acted as one to manage the scene, transporting victims to local hospitals, secure the area, and begin collection of evidence. 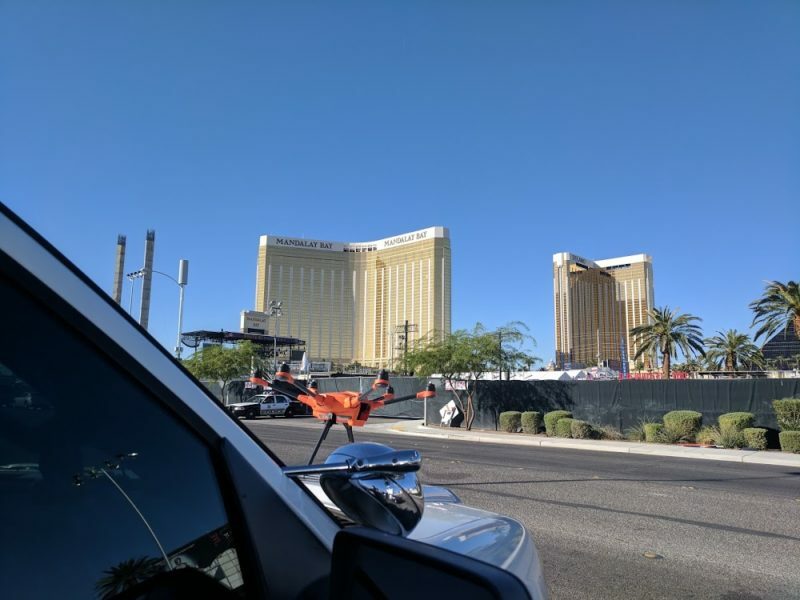 sUAS were a component of the evidence-gathering process under the direction of the FBI and Las Vegas Metropolitan Police Department (LVMPD). 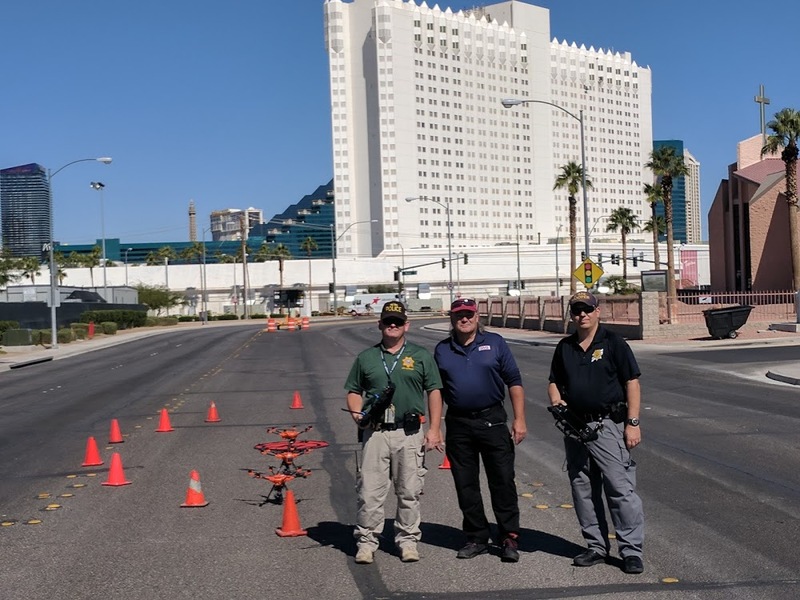 LVMPD partnered with Nevada Highway Patrol’s Multidisciplinary Investigation and Reconstruction Team and their sUAS as part of the scene given the size of the site, and the amount of data that needed to be collected in a short period of time. An outside technical advisor was also brought in to advise and as a subject matter expert to ensure automated mission compliance and best-practices were observed in each of the missions. 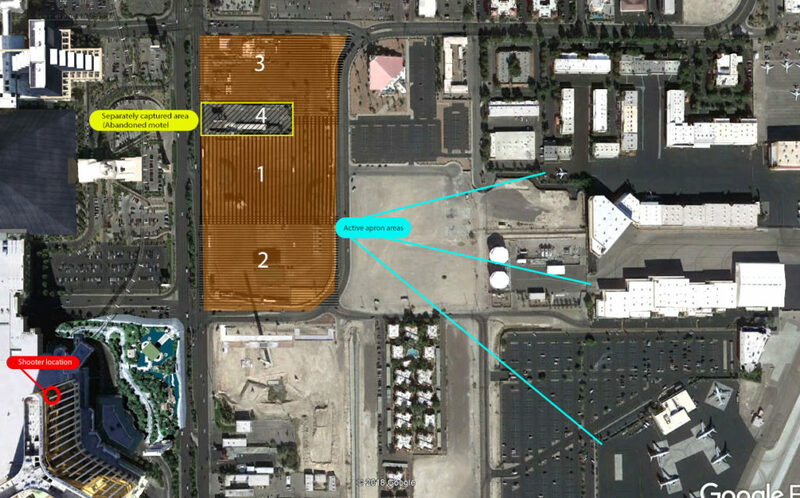 The area to be captured via sUAS was just over 19 acres in overall size. To combat the second issue, altitudes for flight were selected based on height and downdraft from the aircraft. Two types of aircraft were evaluated, a quadcopter and a hexacopter. The hexacopter offered significantly less ground disturbance and was selected for the mission. 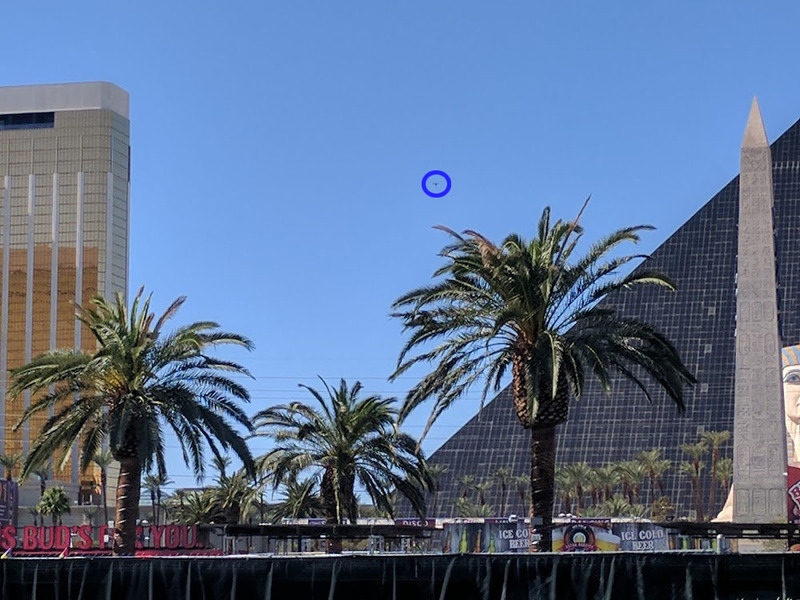 It was also much quieter and was expected to not attract undue attention at any altitude, as there were many tourists along Las Vegas Boulevard. In order to counter the primary issue it was determined that the area would be captured with three simultaneous flights, spatially and temporally separated. The mission requirements shed light on several challenges. The site is located in Class B airspace, less than 500’ from active aprons, taxiways, and runways. An active investigation underway created concern for flight in areas over investigators inside the secured perimeter. Time was at a premium, as this is an outdoor venue and weather/sun were actively degrading evidence. Helicopters from tour companies were not observant of the in-place TFR, and were constantly in the airspace, trying to show the crime scene to tourists. Completing the missions within a narrow window of time was a crucial element so as to obtain the best possible images at all four primary areas of flight without shadow distortion. A delicate balance of altitude and resolution needed to be struck to not affect evidence while obtaining the highest resolution possible. Plans for automated flight were discussed on-site with time of flight determined by angle of sun. Once plans were determined and drawn, FBI and LVMPD personnel approved the automated flight areas, altitudes, and speed of flight. The automated, map-mission flight paths were programmed into each of the three ground stations, and verified by all authorized parties. Flight plans included 85% overlap, 70% sidelap, with 25% additional area beyond the festival grounds captured for clean edges at the optical extremes. North and South areas began flight in an easterly/westerly direction, while the center area began northerly/southerly directions, 5’ lower than north/south units. Temporal, horizontal, and vertical separation ensured no possibility of mid-air collision existed. 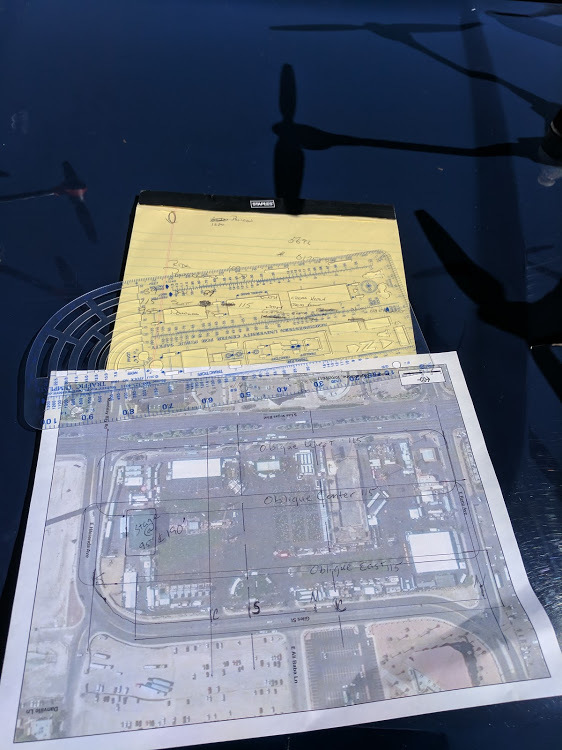 Road closures surrounding the crime scene provided a secure area for launch/recovery of aircraft with no traffic in the area, providing for VLOS over the 19 acre property. Once safety checks and the normal pre-flight checks were completed, the aircraft were placed in the launch/recovery area and three aircraft were launched eight minutes apart. During flight, the ground station controller provided real-time feedback indicating where images have been captured. Donning sterile suits required to enter the perimeter of the crime scene allowed for manual flight in specific areas where closer inspection of complicated surfaces were required. Manual flights inside the area perimeter provided insights not visible from the ground level. Examples of projectile impact were found on a power pole at the intersection of two streets, and two impact points were discovered in the relay tower speakers that had not previously been found. 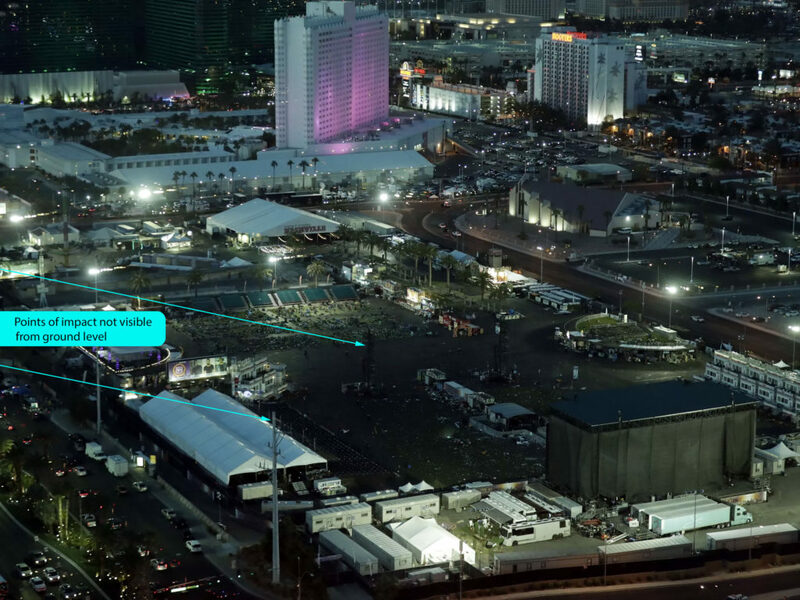 These areas were complicated for UAS flight, crossed with guy wires for tower stability, speaker cables strung across steel rigging, lighting instruments, hot, black metal in turbulent winds in areas where three observers were placed to assist the pilot in flying in these tight, physically and optically challenging spaces around the stage, speaker towers, food court/tents, billboard signage, and fence perimeters. Following the nine flights (3×3) over the main grounds, a separate mission was executed over the abandoned hotel that extends into the entertainment property. 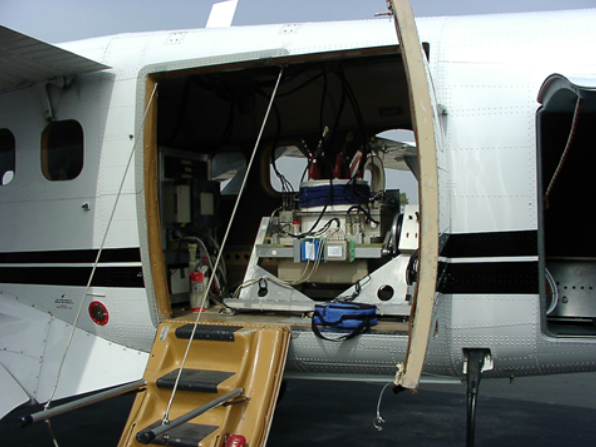 These missions were a combination of manual inspection when potential evidence was observed, and automated mapping flights to capture the at-present data. 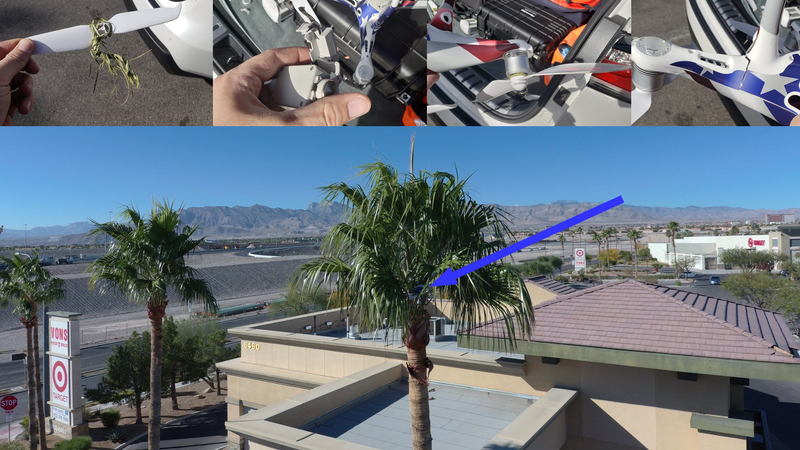 In this particular instance, the benefits of the hexacopter were appreciated; turbulent ground winds, rotors, powerlines, palm trees, a confined area, and limited physical access each contributed to the challenges of this series of missions. VLOS was maintained with the observer standing on the rear of a patrol vehicle due to a high, covered fence and a limited launch area. Three automated group flights at three altitudes, separate stage and hotel flights, manual flight inside the perimeter captured over 6,000 images. These images were input to two dimensional and three dimensional software applications for orthagonal mapping and 3D modelling. Survey markings were taken from previously operated TotalStation sites and physical objects used as GCP. The author has not seen the final results from the orthogrammatic image render. The planned workflow is to render each of the separate areas for consistent GSD, added into a master render for each altitude. Once the flights were complete, memory cards were handed over to the federal agency. This was very much a team effort. ATC, McCarran Airport, FAA, City of Las Vegas, Department of Public Safety, FBI, local subject matter expert, and other investigative agencies worked within a highly communicative environment to ensure no evidence was compromised, that all personnel were aware of each others activities, data/areas logged for clarity, and flights indicated in written, pictorial, and telemetry formats were shared between teams. 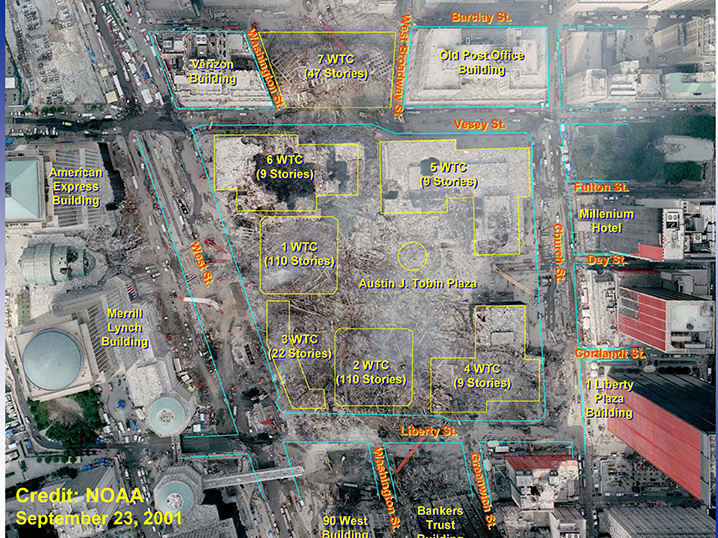 Until October 1, the World Trade Center had been the largest physical crime scene in America with a total area of approximately seven and a half acres. 1 October is nearly three times in size. Due to persons involved with both scenes, availability of data and cost from the two events may be compared and examined to gain an understanding of technical and operational improvements over the past 17 years. 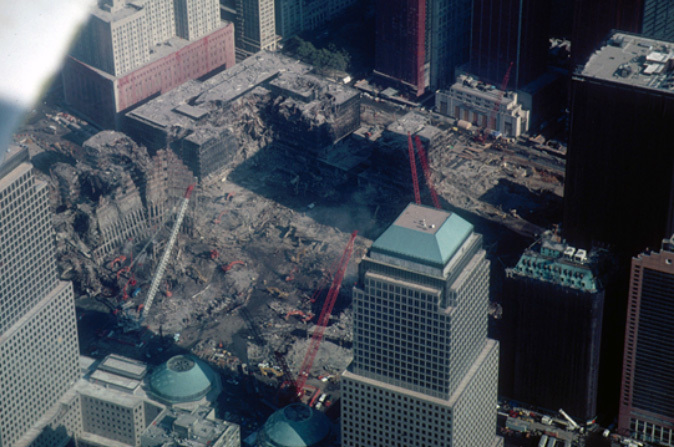 In the last week of September, 2001, a Super Twin Otter with several sensor systems was called up to capture data from the World Trade Center scene. Flying orbital and grid patterns over the course of five days, significant amounts of data were collected for analysis by multiple agencies. Costs were reported over 1.5M, including fuel, personnel, equipment, and time. Although the images captured are still classified, data from surrounding, unrelated areas demonstrate the poor quality of image capture. By comparison with modern technology, the images are of limited value, offering little useful data (by comparison). 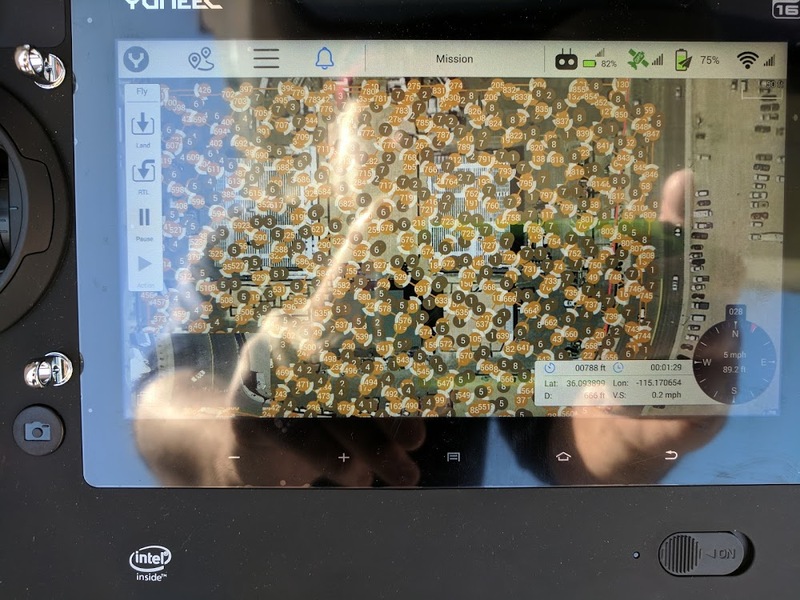 The time, cost, labor, headcount, and quality of data are all areas where UAV have proven their value to law enforcement, and in this case, costing $1.5M vs $15,000 (cost of three aircraft, batteries, and accessories), while providing incalculably greater value through images that may be digitally shared in 2D, 3D form, annotated, analysed simultaneously by multiple agencies and investigators. 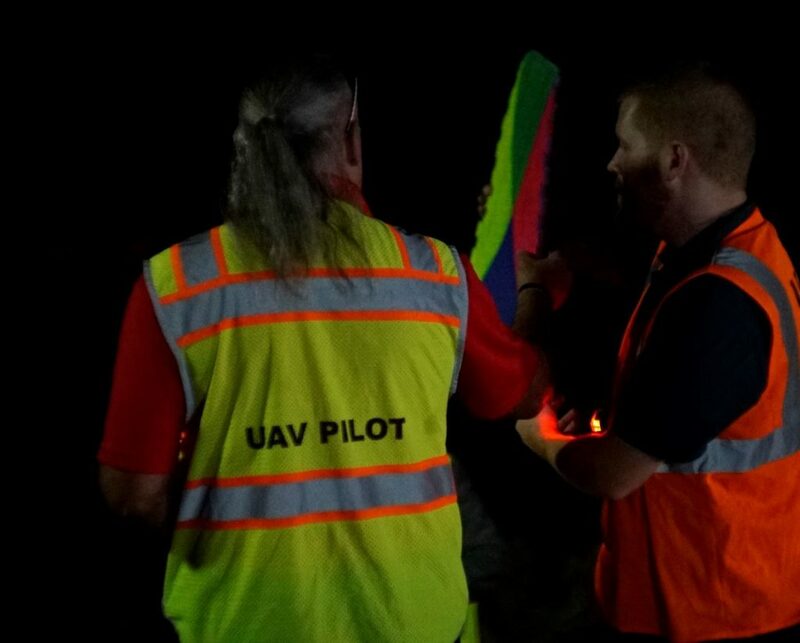 The value of sUAS proved itself through rapid access to available airspace, speed of operation, quality of data, cost of operation, ability of continuous flight, noise and traffic impact on the surrounding area and area of investigation, speed to solution, instant verification of data capture and image quality, ability to simultaneously capture multiple areas, and most importantly, safety to all persons involved in the acquisition of data, processing and investigation of the 1 October scene. Part 91, 101, 103, 105, 107, 137: WHAT’S THE DIFFERENCE? All these FARs, what’s a drone pilot to do in order to understand them? Do they matter? a Remote Pilot Certificate under Part §107 are woefully uninformed, to the detriment of the industry. Therefore, sUAS pilots would be well-served to inform themselves of how each section of relevant FARs regulate components of aviation. Let’s start by digging into the intent of each Part. §Part 91 regulates General Operating and Flight Rules. §Part 101 regulates Moored Balloons, Kites, Amateur Rockets, Unmanned Free Balloons, and some types of Model Aircraft. §Public Law Section 336 regulates hobby drones as an addendum to Part 101. §Part 103 regulates Ultra-Light Vehicles, or manned, unpowered aviation. 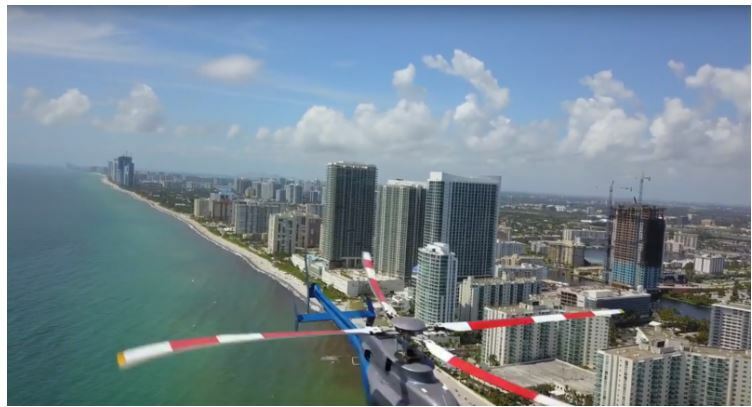 This portion of the FARs is barely recognized, although certain sections of Part 91 may come into play in the event of an action by the FAA against an sUAS pilot. 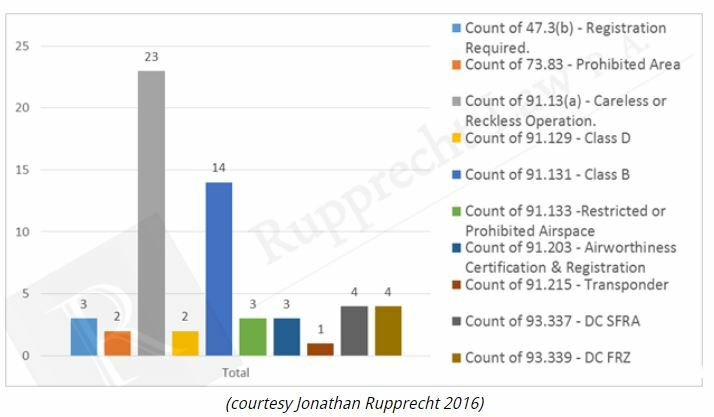 For example, the most concerning portion of Part 91 is 91.13, or “Careless or Reckless Operation.” Nearly every action taken against sUAS pilots have included a charge of 91.13 in the past (prior to 107). Specific to drone actions, The vast majority of individuals charged have also included the specific of a 91.13 charge. It’s pretty simple; if there are consequences to a pilot’s choices and actions, it’s likely those consequences also included a disregard for safety or planning, ergo; careless/reckless. The FAA has recently initiated actions against Masih Mozayan for flying his aircraft near a helicopter and taking no avoidance action. They’ve also taken action against Vyacheslav Tantashov for his actions that resulted in damage to a military helicopter (without seeing the actual action, it’s a reasonable assumption that the action will be a §91.13 or a §107.23 (hazardous operation). (a) Except as provided in paragraphs (b), (c), (e), and (f) of this section and §§91.701 and 91.703, this part prescribes rules governing the operation of aircraft within the United States, including the waters within 3 nautical miles of the U.S. coast. The above paragraph includes sUAS. Additionally, Part 107 does not exclude Part 91. Airmen (including sUAS pilots) should be aware of the freedoms and restrictions granted in Part 91. §91.3 Responsibility and authority of the pilot in command. (a) The pilot in command of an aircraft is directly responsible for, and is the final authority as to, the operation of that aircraft. (b) In an in-flight emergency requiring immediate action, the pilot in command may deviate from any rule of this part to the extent required to meet that emergency. (c) Each pilot in command who deviates from a rule under paragraph (b) of this section shall, upon the request of the Administrator, send a written report of that deviation to the Administrator. (a) No person may operate a civil aircraft unless it is in an airworthy condition. (b) The pilot in command of a civil aircraft is responsible for determining whether that aircraft is in condition for safe flight. The pilot in command shall discontinue the flight when unairworthy mechanical, electrical, or structural conditions occur. No pilot in command of a civil aircraft may allow any object to be dropped from that aircraft in flight that creates a hazard to persons or property. However, this section does not prohibit the dropping of any object if reasonable precautions are taken to avoid injury or damage to persons or property. Part §101 has a few applicable sections. Subpart (a) under §101.1 restricts model aircraft and tethered aircraft (balloons). Although subpart (a.4. iiv) is applicable to balloon tethers, there is argument that it also applies to sUAS. Subpart (a.5.iii) defines recreational flight for sUAS/model aircraft. Finally, §101.7 re-emphasizes §91.15 with regard to dropping objects (may not be performed without taking precautions to prevent injury or damage to persons or property). Public Law 112-95 Section 336 (which may be folded into a “107 lite” version), clarifies sections not added to Part 101. 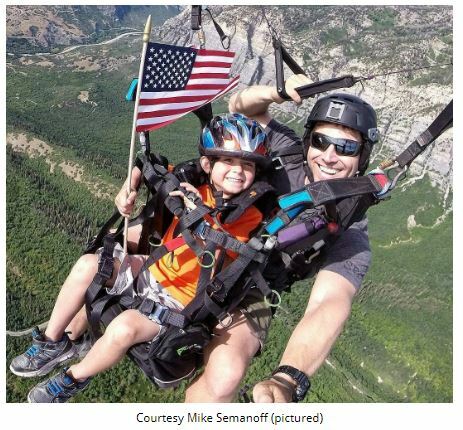 Bear in mind that unless the pilot follows the rules and guidelines of a NCBO such as the AMA, AND the requirements of that NCBO are met, the flight requirements default to Part 107 requirements. 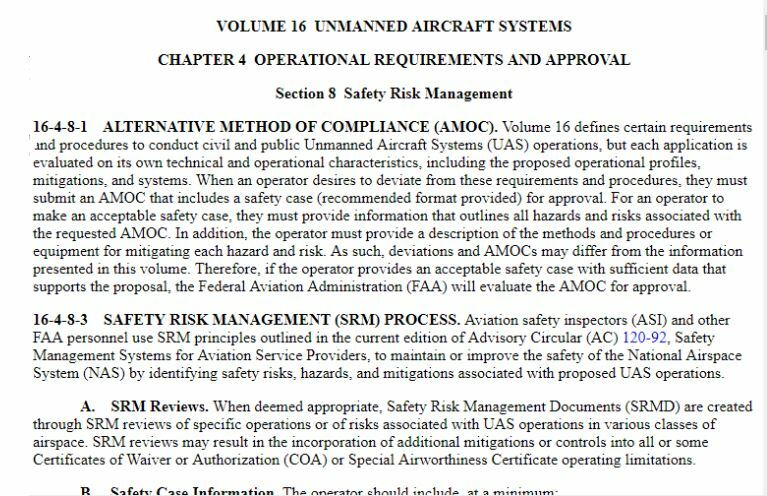 Although no component of Part §103 specifically regulates UAV, it’s a good read as Part 103 contains components of regulation found in Part 107. Part §105 carries no specific regulation to sUAS, an understanding of Part 105 provides great insight to components of Part 107. Part 107 has very few “new” components; most of its components are clipped out of other FAR sections. Although many sUAS pilots “have their 107,” very few have actually absorbed the FAR beyond a rapid read-through. Without a thorough understanding of the FAR, it’s difficult to comprehend the foundation of many rules. Part 137 applies specifically to spraying crops via aerial vehicles. Those looking into crop spraying via sUAS should be familiar with Part 137, particularly with the limitations on who can fly, where they can fly, and how crops may be sprayed. One area every ag drone pilot should look at is §137.35 §137.55 regarding limitations and business licenses. The bottom line is that the more informed a pilot is, the better pilot they can be. While there are many online experts purporting deep knowledge of aviation regulations and how they specifically apply to sUAS, very few are familiar with the regulations in specific, and even less informed as to how those regulations are interpreted and enforced by ASI’s. We’ve even had Part 61 pilots insist that the FSDO is a “who” and not a “what/where.” Even fewer are aware of an ASI and how they relate to the world of sUAS. Familiarity with the FSIMS may enlighten sUAS operator/pilots in how the FAA examines, investigates, and enforces relevant FARs. Chapter 1 Sections 1, 2 and 4 are a brief, but important read, as is Chapter 2, Section 2. 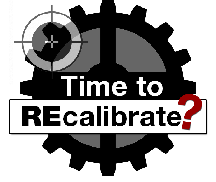 Chapter 3 Section 1 is informational for those looking to apply for their RPC Part 107 Certificate. Chapter 4 Sections 2, 5, 7, 8 are of particular value for commercial pilots operating under Part 107. Volume 17, although related only to manned aviation, also has components related to 107, and should be read through (Chapters 3 & 4) by 107 pilots who want to be informed. Gaining new information is always beneficial, and even better if the new information is implemented in your workflow and program. Become informed, be the best pilot you can be, and encourage others to recognize the value in being a true professional, informed and aware. 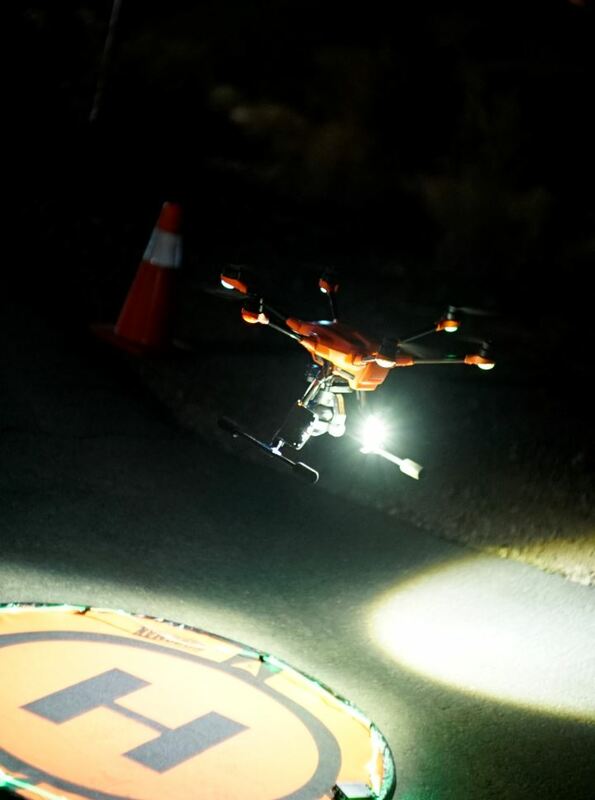 FoxFury, Pix4D, Sundance Media Group (SMG), and the Nevada Drone Center of Excellence came together during the InterDrone Conference, sharing techniques and technology used for capturing forensic scenes during night hours. This event will be repeated during the Commercial UAV Expo in Las Vegas on October 3, at the WestGate hotel. Register now for the Commercial UAV Expo CSI demonstration. Sundance Media Group and the CSI data may also be viewed at Booth #5413 at the Global Security eXchange Security Conference and Expo, September 23-27 in Las Vegas, NV at the Las Vegas Convention Center. Register for the GSX show HERE. 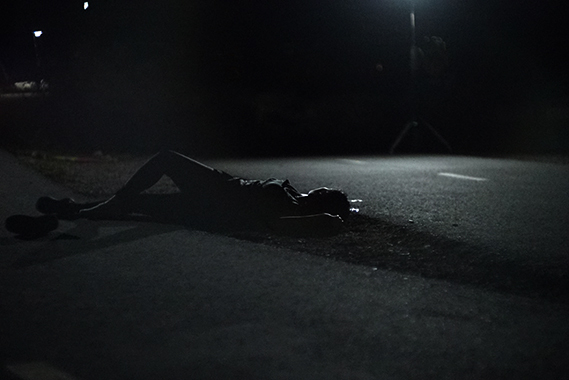 Using FoxFury Nomad Hi CRI, daylight-balanced lighting, to light the scene in an area of East Henderson where no power and no available light existed, the team used Hollywood makeup techniques, a bit of stage blood, and shell casings to re-create a genuine crime scene. The “crime scene” was kept pristine as nearly 100 attendees looked on. The FoxFury Nomads, properly positioned, provide a no/low-shadow environment with accurate colors. “Most LED lighting systems will generate a color-cast that may create problems in the post-capture investigation. Moreover, the lights do not require cabling that can trip up those on-scene, or create their own form of scene contamination. To place them, we merely pull down three legs, raise the pillar, and power up the lights. At half intensity, the lights provide approximately 12 hours of lighting,” says Douglas Spotted Eagle of Sundance Media Group. The FoxFury Nomads may be charged over a 12v connection in a patrol/support vehicle as well. 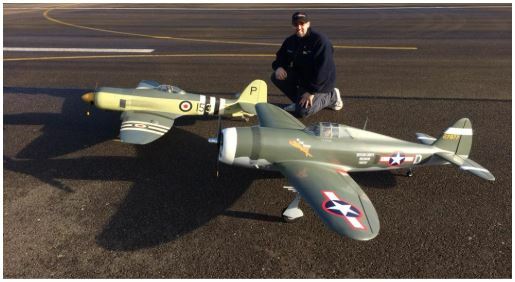 FoxFury Rugo’s are placed on the aircraft for additional lighting as well as for FAA compliance. The Rugo provides a constant flash indicator in addition to options for Flood, Flat, or Pinspot light distribution. The Rugo mounts for the Yuneec and DJI products offer a 360 swivel, allowing for light control in any direction. Users may choose from four intensities in addition to the flash/cycle option. Ground Control Points were laid into place on the perimeter of the scene, taking care to ensure no one stepped into the scene. These are used as tie-points during the 2D and 3D assembly of the data, using Pix4Dmapper. The GCP’s for night capture are painted with Day-Glo paint colors for bright visibility and identification in the darkness of night. 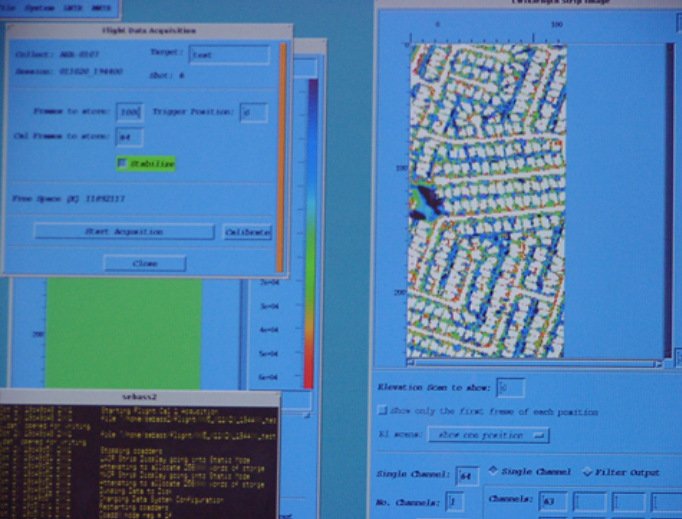 Similar techniques may be employed during thermal mapping projects (Pix4Dmapper on the desktop may be used for thermal mapping if the thermal camera properly embeds/captures meta-data). Shown here by Brady Reisch of the SMG team, the GCP’s are a highly-valued component to set scale constraints to the scene. The area was flown with a drone equipped with a camera capturing GPS location, capturing a reduced area for purposes of avoiding flight over persons, and for expediency during the demonstration. The sUAS captured nearly 100 photos used to create the overall model/map of the scene. Normally, the scene would encompass the entire area in the event that there may be more clues hidden in the brush or sandy areas surrounding the site. Thermal may also be used to search for other bodies, or persons involved in the crew. 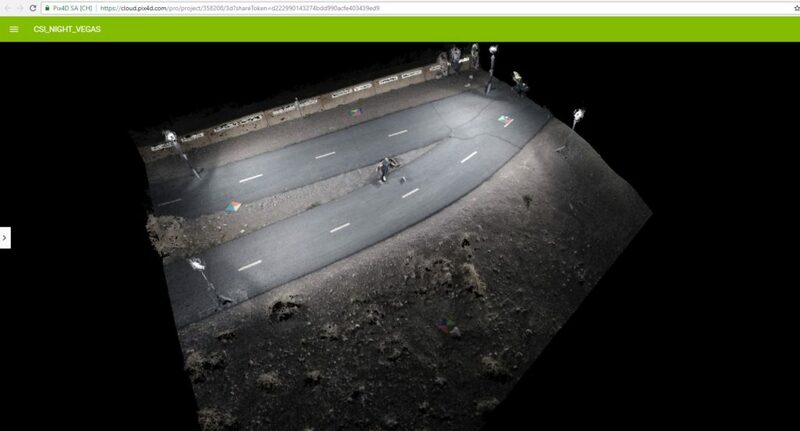 The point cloud of the scene is shared online here. Hold CTRL+SHIFT to rotate the scene in 3 dimensions. Once the scene is captured, the rectified scene may be viewed internally or via secured online site by CSA, or Crime Scene Analysts, allowing measurements to be verified, retaken, or examined from a multitude of angles. 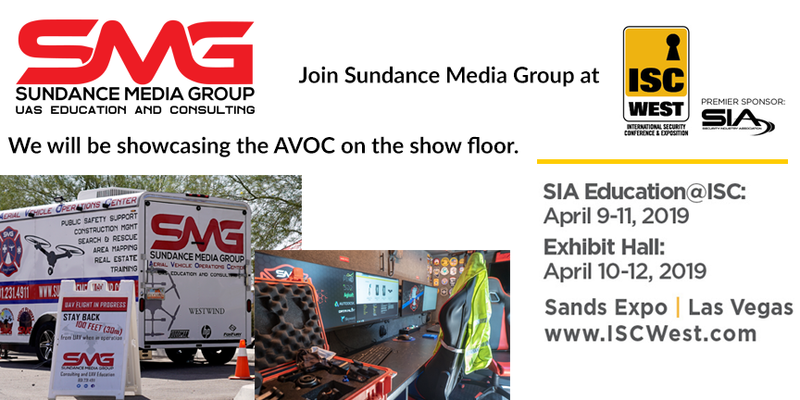 The Sundance Media Group team will be demonstrating this experience at the Commercial UAV Expo in Las Vegas on October 3. Location TBA, near the WestGate hotel (walking distance). REGISTER HERE. It is recommended that attendees register early. The last event ran out of space/slots within three days. 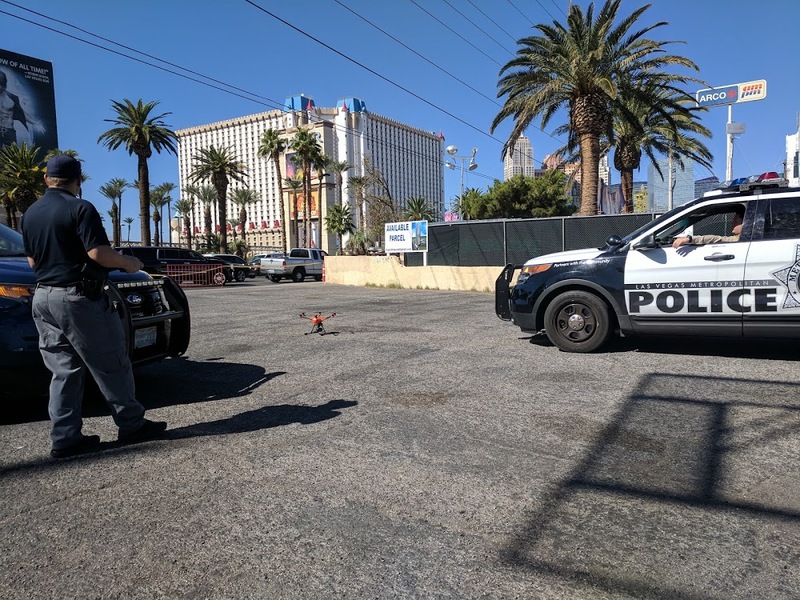 Thank you to Pix4D, FoxFury, Brother, NDCOE, WestWind Unmanned, Las Vegas Metro, Henderson PD, and Sundance Media Group for their efforts to bring this to the attendees of the InterDrone event. Douglas Spotted Eagle addresses a crowd of nearly 100 attendees at the CSI demo. Sam Pepple of Pix4D addresses the crowd, describing how Pix4D will be used to capture the scene, the importance and value of GCP, and why these models are valuable to crime scene investigators. An investigator briefs the crowd on how UAS are changing the face of scene capture, and details how a scene is approached, observed, captured, and processed. We captured the scene using multiple drones. Brady Reisch captured video of the event; we’ll soon have that available for viewing. The SMG AVOC was the hub of activity prior to the night flight. Pizza and drinks provided by FoxFury and Pix4D. 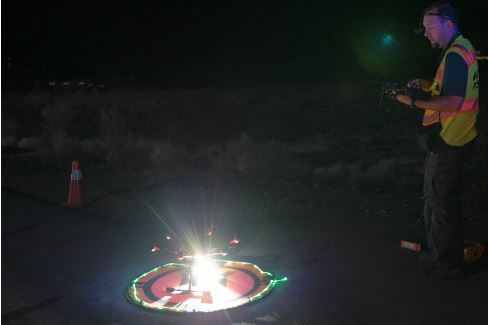 The FoxFury Rugo lights are a key component to SMG night flight. They may be mounted to nearly any sUAS platform including Yuneec H520, Hplus, DJI Phantom, Inspire 1, Inspire 2, Matrice 200 series, AEE Mach 4, and many others. 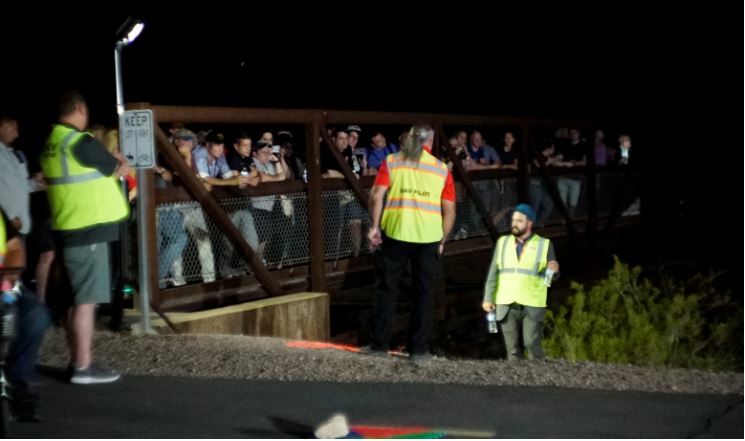 FoxFury, Sundance Media Group, and public safety personnel will demonstrate how to achieve scene capture in the dark, with a drone, capable of 2D and 3D mapping and modelling. These same techniques may be applied to virtually any type of night scene capture. 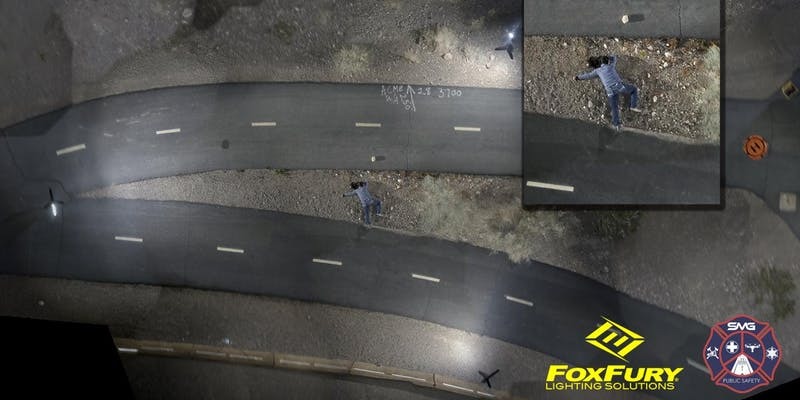 A known crime scene has been recreated and will be flown with both night-vision and standard RGB cameras to demonstrate the viability of wide-variety of non-specialized cameras in dark crime scene capture environments. Pix4D Fields (a new product) will be demonstrated live on-site, for rapid verification of image capture and area integrity. Pizza will be served; please register so that everyone attending will have access. Cameras are permitted. Please; no photography during drone flights.